Fingerprinting has been used for more than a century: what are the basic characteristics? A woman has been murdered. When the detectives arrive on the scene, the house is in shambles. Clothes are strewn about the floor, lamps are overturned and there's no sign of the assailant. Then, one of the detectives picks up a glass. On its side is a smudged, bloody thumbprint. He takes it down to the lab, where it's analyzed and matched to a recorded set of prints. The detectives catch their killer. This scene has been replayed in one crime drama after another. Ever since scientists discovered that every person's fingerprints are unique, and police officers realized this singularity could help them catch criminals, fingerprints have been an integral part of the law enforcement process. Today, fingerprints are also used to prevent forged signatures, identify accident victims, verify job applicants and provide personalized access to everything from ATMs to computer networks. But fingerprinting has come a long way from the days when police officers lifted prints from a crime scene and checked them manually against their files. Modern fingerprinting techniques can not only check millions of criminal records simultaneously, but can also match faces, backgrounds and other identifiable characteristics to each perpetrator. 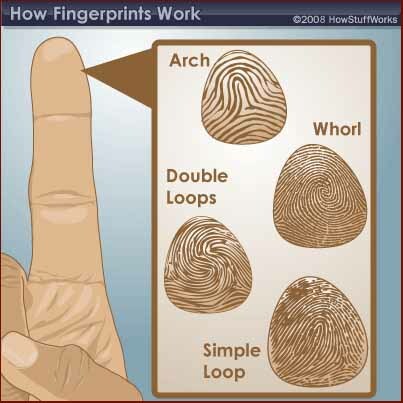 What are the basic characteristics of a fingerprint? How long have people been using prints as a form of identification? Although hands and feet have many ridged areas that could be used for identification, fingerprints became a popular form of biometrics because they are easy to classify and sort. They're also accessible. • Loops begin on one side of the finger, curve around or upward, and exit the other side. There are two types of loops: Radial loops slope toward the thumb, while ulnar loops slope toward the little finger. • Whorls form a circular or spiral pattern. • Arches slope upward and then down, like very narrow mountains. Scientists look at the arrangement, shape, size and number of lines in these fingerprint patterns to distinguish one from another. They also analyze very tiny characteristics called minutiae, which can't be seen with the naked eye. You'll see in many modern-day movies or television shows like 24, where people use body parts to overcome and bypass biometric security. With our product you're looking at moving the deoxidized hemoglobin that's moving through the vein pattern. You have a near-infrared signal that comes up from a sensor; it reflects off of the hand. The blue blood that's moving without oxygen through your hand actually absorbs the light and what's emitted back is the pattern, the vein pattern. It absorbs that light that's emitted from the sensor. • Visible prints are made on a type of surface that creates an impression, like blood, dirt or clay. • Latent prints are made when sweat, oil and other substances on the skin reproduce the ridge structure of the fingerprints on a glass, murder weapon or any other surface the perpetrator has touched. These prints can't be seen with the naked eye, but they can be made visible using dark powder, lasers or other light sources. Police officers can "lift" these prints with tape or take special photographs of them. CAN YOUR FINGERPRINTS BE CHANGED ... OR STOLEN? 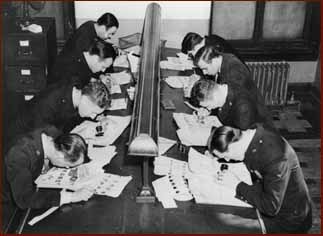 In 1901, Scotland Yard established its first Fingerprint Bureau. The following year, fingerprints were presented as evidence for the first time in English courts. 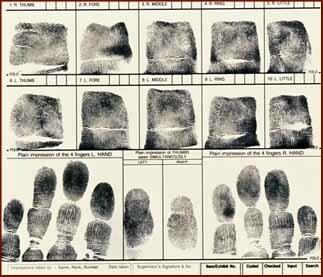 In 1903, the New York state prisons adopted the use of fingerprints, followed later by the FBI. But how has fingerprinting changed since the 19th century? In the next section, we'll find out about modern fingerprinting techniques. A background and identity check fingerprint capture machine is displayed in London. 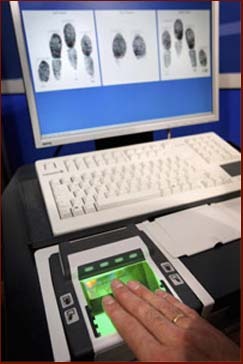 Modern technologies have made finger printing a much more effective means of identification. The Henry system finally enabled law enforcement officials to classify and identify individual fingerprints. Unfortunately, the system was very cumbersome. When fingerprints came in, detectives would have to compare them manually with the fingerprints on file for a specific criminal (that's if the person even had a record). The process would take hours or even days and didn't always produce a match. By the 1970s, computers were in existence, and the FBI knew it had to automate the process of classifying, searching for and matching fingerprints. The Japanese National Police Agency paved the way for this automation, establishing the first electronic fingerprint matching system in the 1980s. Their Automated Fingerprint Identification Systems (AFIS), eventually enabled law enforcement officials around the world to cross-check a print with millions of fingerprint records almost instantaneously. AFIS collects digital fingerprints with sensors. Computer software then looks for patterns and minutiae points (based on Sir Edward Henry's system) to find the best match in its database. The first AFIS system in the U.S. was speedier than previous manual systems. However, there was no coordination between different agencies. Because many local, state and federal law enforcement departments weren't connected to the same AFIS system, they couldn't share information. That meant that if a man was arrested in Phoenix, Ariz. and his prints were on file at a police station in Duluth, Minn., there might have been no way for the Arizona police officers to find the fingerprint record.